On the eve of DEFSEC Atlantic, Irving Shipbuilding installed the final piece of the steel frame that makes up its new assembly and production facility in Halifax. At a ceremony attended by federal, provincial and municipal politicians, employees of Walters Steel and members of Ironworkers Local 752 raised the last, signed structural steel beam. It was a proud moment for Kevin McCoy, the company’s president. But it also served as a reminder of how much remains to be done before the Halifax Shipyard begins work on the first class of navy ships under the National Shipbuilding Procurement Strategy (NSPS). 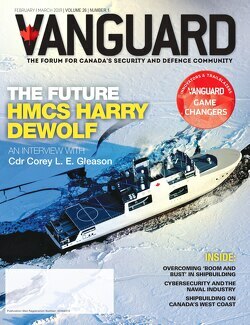 McCoy talked in terms of firm timelines – a rare occurrence for process many see as moving too slowly – and not only for the AOPS, but also for the Canadian Surface Combatant. Not only do targets have to be met over the next nine months to ensure construction begins on the AOPS next summer, key issues need to be resolved before 2020 when the final patrol ships are nearing completion and the CSC is slated to begin. McCoy expects to close a contract with the government by January in order to then begin placing orders for materials. Both AOPS and the CSC will be constructed in one of the largest single ship construction buildings in North America, and using some of the most advanced systems. “We are building ships in the most modern way that they are being built around the world. We have been exhaustive in the benchmarking. Everything is digital,” he said. That includes a workforce that can meet the highest international standards. To that end, Irving has been working with Nova Scotia Community College on a curriculum to deliver its digitally comfortable workforce. If there are doubts about what this means to the Canadian economy, McCoy said that on the facility alone Irving will have invested approximately $340 million, almost 80 percent of which will have gone to Canadian companies. “You don’t have to wait to build ships to get serious about the economic impact from NSPS,” he concluded.